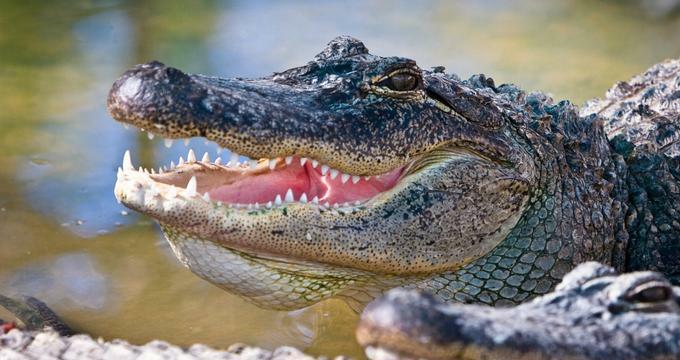 The Gator Country Rescue is the biggest alligator park and sanctuary in the area of Southeast Texas. Guests of all ages that visit the rescue can plan to have fun as well as learning about the importance of the reptiles that call it home. Opened in 2006, Gator Country in Beaumont, Texas houses over 350 different reptiles in an attempt to help rescue and preserve these important animals while also teaching the general public. Gary Saurage is the heart behind the rescue, having founded it just off of Interstate 10. In fact, Gary and his team of experts often known to rescue these reptiles from ponds, pools, backyards, and other areas where people live and bring them to safety (often at the staff’s own peril!). Gator Country Rescue sits on just over 15 acres and is always interested in continuing to grow their space and to be able to help more reptiles. The Gator Country Rescue is home to many different types of reptiles (not only alligators!). While they do have a number of American alligators, the rescue also houses crocodiles and other reptiles. The majority of reptiles that live at the rescue have come there either being declared “nuisance” rescues, transfers from other similar institutions, or even donations. Make sure to see Big Al while visiting! At over 80 years old, 13 feet long, and more than 1000 pounds, he is the largest alligator that currently lives in captivity in the state of Texas. Another new, record-setting addition is Big Tex, who sets the record for the biggest live captured “nuisance” alligator in captivity. He also comes in at just over 13 feet long. In addition to the reptiles themselves, the rescue also offers a few other attractions that guests may enjoy while visiting. · Boat tours: Guests can make a reservation (at least 24 hours in advance) to take a swamp tour by boat, which will allow them to get up close and personal with much of the wildlife as well as the beautiful scenery of the Taylor Bayou. Each tour is kept small so that guests have the ability to ask questions and have more personalized attention from the knowledgeable guides. Tours will also include a discussion about the importance of the bayou’s ecology and all of the different species that live there. Make sure to pay attention to the bald cypress trees, covered in beautiful Spanish moss. Tours last just over an hour and guests are strongly urged to bring their own binoculars, drinks (coolers are allowed), bug spray, and sunscreen. · Shows: There are three different educational shows that the rescue puts on for visitors. Every show and encounter concludes with an opportunity for guests to actually hold one of the reptiles that live at the park as well has have their picture taken with it (if they are brave enough!). For guests interested in feeding the gators, “gator feed” can be purchased by the bag for a nominal fee. There is a small cost for admission to the rescue (children are offered a slightly discounted admission fee), which includes various animal encounters and the shows mentioned above. It is open every day from 10am to 5pm. Field trips to the rescue are more than welcome and can be a great way to get students out of the classroom and into learn about reptiles in as close to their natural habitat as they can get in captivity. Prices are set for field trips according to the size of the group and start at groups with at least 20 students. 20 to 40 students are one price, 41 to 74 students are a slightly more reduced price, and groups with more than 75 students receive the cheapest discount. Adult chaperones are also required to pay and no discount is provided. Teachers, however, will receive a 50% discount. Field trips must arrive at the rescue between 10am and 10:30am and a cancellation fee will be required for field trips that do not cancel at least 16 hours before the planned visit. Contact the staff at the rescue for additional information and to get the form needed to reserve a time slot. Gator Country offers a small gift shop on the premises. Guests who want to commemorate their visit with a souvenir can pick up a t-shirt with the rescue logo on it, other smaller gifts like postcards and keychains, or even stuffed animal alligators for the children. Donations are also always welcome and help fund the care of the reptiles as well as maintenance of the grounds.